Black panthers, i.e. melanistic leopards, are exotic-looking felids at the best of times, but the individual constituting the principal subject of this present ShukerNature blog post was a truly exceptional female black panther, purchased from Dublin Zoo during the early 1980s, and exhibited for a few years at Glasgow Zoo before being sold overseas, probably destined for Madrid Zoo. On first sight, one could be forgiven for assuming that this extraordinary animal had recently strolled through an unusually dense sheet of cobwebs, for its entire coat appeared to be covered in a fine white filigree of gossamer. On closer inspection, however, this 'gossamer' proved to be a profuse sprinkling of white hairs among its otherwise uniformly-black coat. Old black-furred mammals sometimes exhibit a gradual silvering of their fur with advancing age. 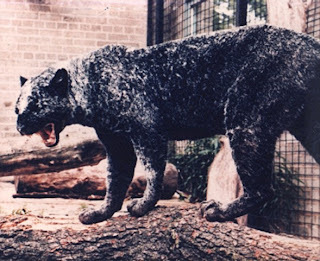 However, this panther's silvering was so extensive that Richard O'Grady, a former director of Glasgow Zoo, was convinced that it was due to a genetic mutation, and he also noted that its gums were unusually pink. Moreover, although the panther was 10-11 years old when it arrived at Glasgow, Richard had first seen it some time earlier, when it was at Dublin, and it was no less silvered then, again ruling out an age-related explanation. 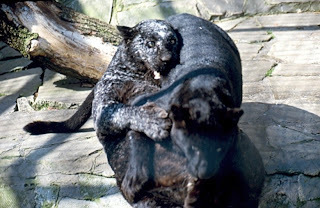 Consequently, I would assume that the Glasgow Zoo 'cobweb panther' possessed not only the Agouti gene's recessive non-agouti mutant allele (like normal black panthers), but also a mutant allele (of some other gene) for silvering. 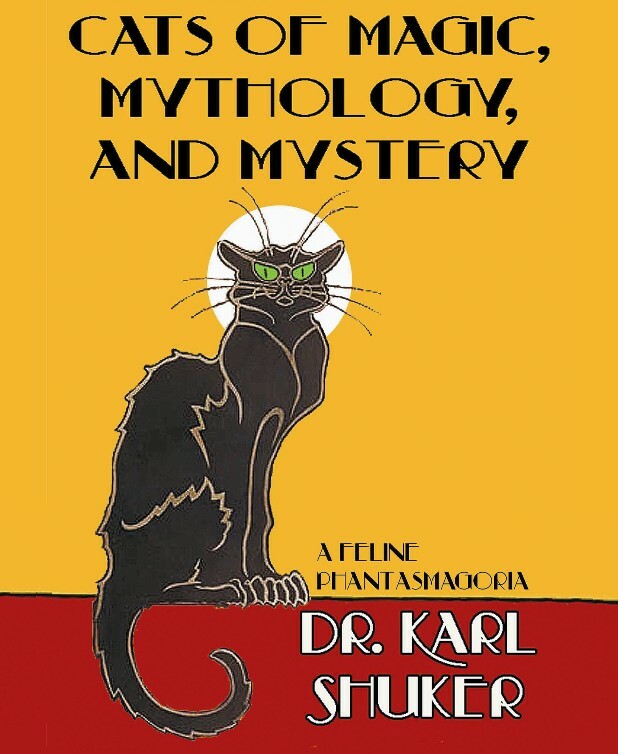 One writer has claimed that this cat was exhibiting piebaldism, but that is incorrect, because piebaldism typically features entire patches of white skin or fur (piebald horses are a well known example), not merely a sprinkling of white hairs in an otherwise dark pelage. "She had two litters of cubs that I am aware of, one on the 15/08/1981 consisting of 3 black cubs (gestation 96 days) - 1 DNS [Did Not Survive] leaving 1.1 to be reared. Another on the 24/04/1983 consisting of 1, black, male cub born after a gestation of 99 days. 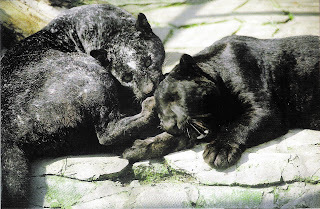 She was always mated to a melanistic male. She was a good mother as she reared two cubs from her first litter at Glasgow and was a calm, easy going individual." I have been informed that at least one other captive cobweb panther has been recorded, but as yet I have no further details regarding it. 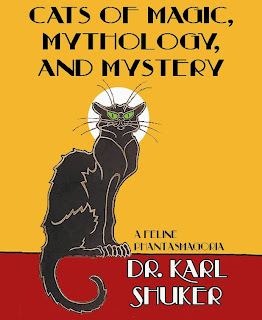 This post is excerpted from my latest book, Cats of Magic, Mythology, and Mystery (CFZ Press: Bideford, 2012); my grateful thanks to Graham Law for so kindly making available his photographs for me to use in this segment of my book. 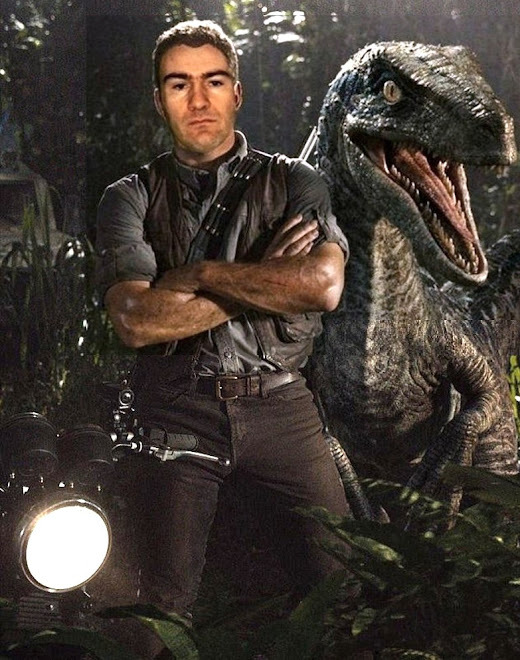 Great to see Graham and Glasgow Zoo having a mention. Richard O'Grady passed away while at work, his post was taken over by Roger Edwards. I have some pictures which Graham does not have of the Cobweb, though taken with Graham, these pictures are private and will be published in my own book regarding the later days of Glasgow Zoo. I wonder if her coloration is the result of the same gene mix that causes some melanistic big cats to have patches of normal coloration... just presented in an odd, and strikingly unique, sort of way.